Online Payment: We use PayPal to provide safe and secure processing of your credit card or bank check information. You do not need a PayPal account to complete your purchase. Simply click on the "Continue" link where it says "Don't have a PayPal account?" Shipping: The Stoven Hardwood Pellet-Fired Grill Conversion Unit items can only be shipped to the 48 contiguous states. Will Call pickup is also available at our Sacramento, California warehouse. We regret it cannot be shipped to APO/FPO, Hawaii, Alaska, or Puerto Rico. Final shipping and handling fees can be determined by entering your zipcode on the first page of the shopping cart. Click Here to see our UPS Ground shipping chart. The following accessories are currently available ONLY by warehouse pickup in the Sacramento, California region offered through this Website. BEFORE you place and pay for your item, please get confirmation by email for product availability and scheduling your warehouse pickup. Please send an email to "info@americansundancer.com" stating your product request; your name and phone number, and a representative will call you to arrange. All Natural Hardwood Pellets  No Additives! 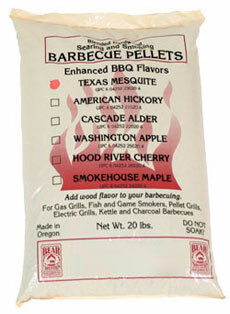 All Natural BBQ Pellets offer a quick and easy way to add delicious natural flavors to any meal. Impress your family and friends by adding original smoked flavoring to your next BBQ. Can be used with all outdoor BBQ grills. 100% Natural, made from virgin hardwoods. American Hickory: Rich, smoky flavor for a bacon-like taste on all meats. Texas Mesquite: Strong, tangy flavor for red meats with a rich campfire taste. Cascade Alder: Mild flavoring with a hint of sweetness for seafood and poultry.